Christmas Coupons for Kids - Free Printable! 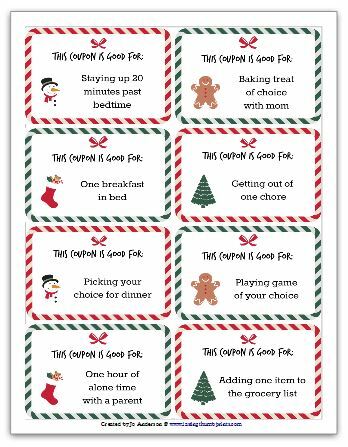 Christmas Coupons for Kids – Free Printable! I don’t know what it is, but this year I’ve been struggling with how I wanted to fill my children’s stockings. I can usually find a few unique items that make me excited to see their faces, but I just haven’t found the right thing this year. And with a limited Christmas budget, I definitely don’t want to use money on cheap fillers. If you’re in the same boat or find yourself looking for a frugal way to give your children a special treat, these might be just what you’re looking for as well. One of the things that I love about these coupons is that they also provide another opportunity to spend some intentional time with my children! 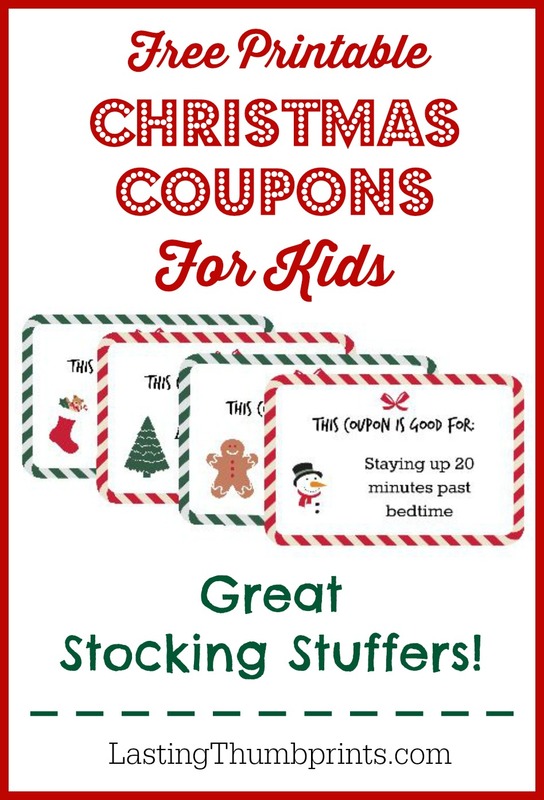 Christmas Coupons for Kids – Free Stocking Stuffers! There are 8 free Christmas coupons in this printable. I have also included a blank sheet of coupons in case you would like to create your own personal coupons for family or friends! Grab your Free Printable Christmas Coupons for Kids and other exclusive freebies and content by subscribing to the Lasting Thumbprints newsletter below. So now I want to know, what are your favorite ways to fill stockings? Do you ever struggle with finding just the right things? Thank you so much! These are Fantastic… I had to share with my readers. If you like, please stop by and take a look. Thank you. I have been keeping an eye out for great budget friendly items and this is perfect. Merry Christmas. I truly understand that you might be busy with your work and didn’t find time to check mail. That’s okay. I would be happy to hear from you regarding my previous email.